Domino’s Spreads Love with Free Extra Cheese For All Pizzas! Cheese, cheese and more cheese! And the best part is, it’s for free! Domino’s Pizza is splurging on giving free extra cheese for all pizzas to all its customers. It is no secret that Cheese is the key ingredient to pizzas as it brings together all the flavors of the pizza toppings. 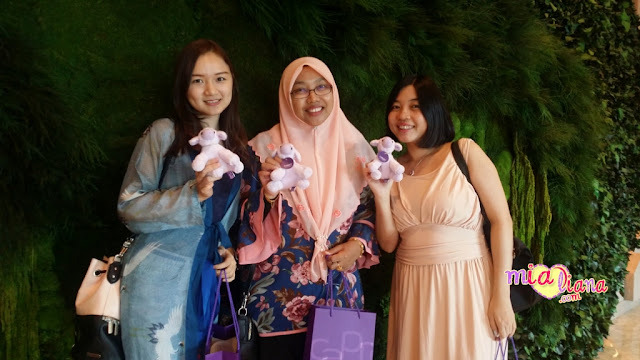 Known for its promise in delivering value in exciting ways and forms, Domino’s Pizza is delighted to offer customers an enjoyable experience with one of Malaysia’s favorite ingredients. 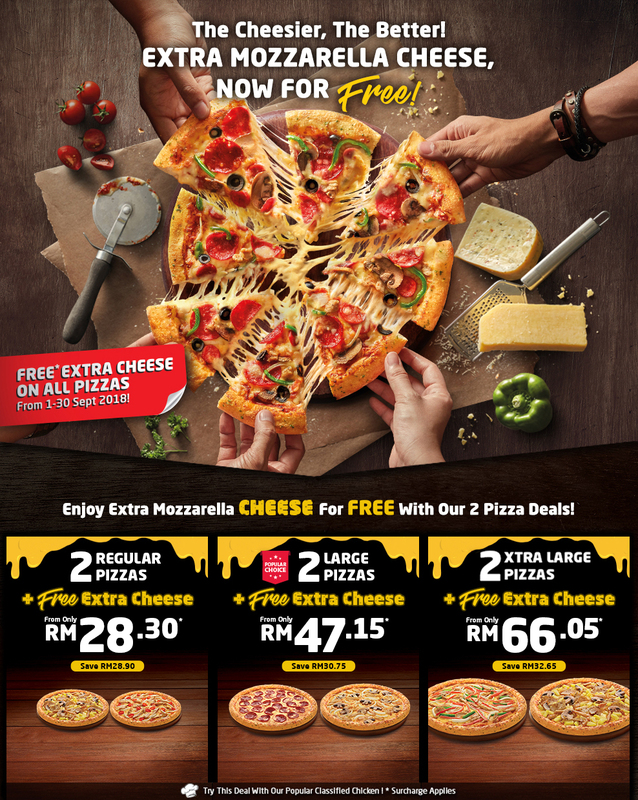 Inspired and always driven by its customers love for cheese, Domino’s is expected to give out free extra cheese from now until 7 October, 2018. Committed to ensuring high quality products for its customers, Domino’s Pizza uses a specially developed cheese for its pizzas. It’s new and improved Mozzarella cheese presents a luscious, indulgent and creamy taste, the perfect combination for cheese lovers. As appealing as the taste, is the stringy and melted cheese texture in every bite that enhances the taste of the pizza toppings, without overpowering it. During the campaign period, all pizzas will be topped with extra cheese for items bought as ala carte or through Domino’s various value for money deals. 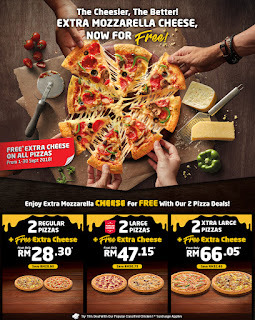 For even greater value, order the 2 Pizza Deals with free extra cheese at only RM28.30, RM47.15 and RM66.05 for the two Regular pizzas, two Large pizzas and two Xtra Large pizzas respectively. *Surcharge applies. Get your extra cheese at all Domino’s Pizza stores. Visit our stores, order online at http://www.dominos.com.my/, or call 1300-888-333 to make an order.